I feel like I've been favouring J. Herbin ink for the last few weeks, but as I sunk my teeth into a juicy citrus fruit this afternoon, I just couldn't help myself. Images of Orange Indien flew into my mind and wouldn't leave me alone! This is an ink that I haven't paid too much attention to, yet it has been selling well. The box stands out on the shelf because it has a uniquely bright colour and a super fun elephant on the front. It has always attracted me. Yet I haven't touched the ink! How come?! This beautiful blot is full of vigour and leaps out of the page at you. It initially gives a bright orange colour then darkens as it dries, still remaining very attractive. I think I'm obsessed! But I won't lie! 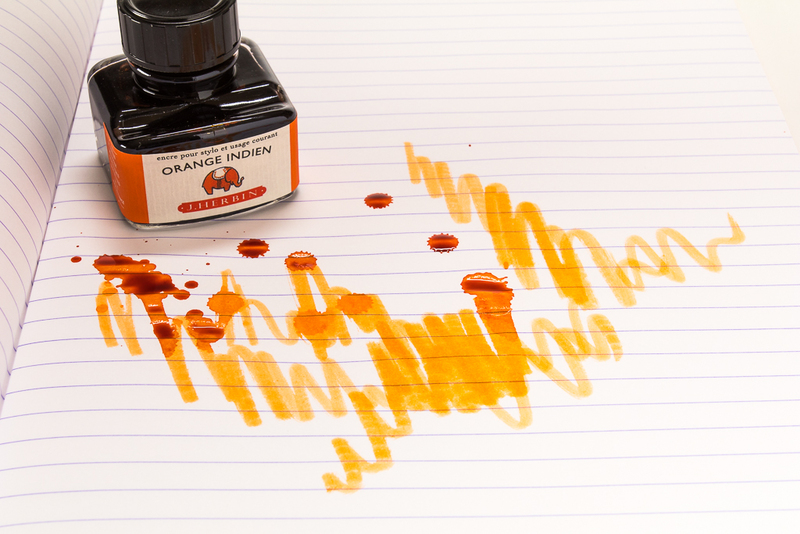 I'm not entirely sure why Indian Orange is the name of the ink. Do you know? Regardless, this is a beautiful ink and comes in a bottle or international standard cartridges to fit most fountain pens.